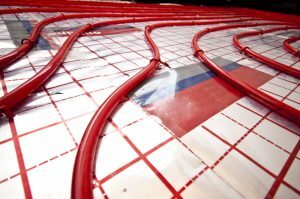 What is Radiant Heating Exactly? So when you think of a traditional heating system, you think of hot air blowing throughout your home—radiant heating takes a different approach. Radiant heating distributes thermal energy by transmitting warmth through objects in your home. These objects are typically radiators or baseboard heating systems and the source point is typically a boiler. Radiant heating is great for our climate here in Pennsylvania because of the unmatched warmth and efficiency this system provides. You wake up to the ring of your alarm on a cold winter morning and your feet hit the smooth surface of your hardwood flooring and it’s freezing! We can help eliminate this unpleasant experience entirely. We specialize in in-floor heating here at Murphy’s Plumbing, Heating, & Air Conditioning. Why? Prompt Heating: Don’t wait to warm up. In-floor radiant heating warms up your home fast because it heats directly from the floorboards to the people and objects in the room. Efficiency: This is one of the most efficient ways to heat your home in our cold climate. Your boiler pumps heated water through a tubing pattern laid under the floor helping regulate room temperature thoroughly. Lifespan: A boiler is one of the longest lasting heating systems on the market and the pipes we run through your home to provide the radiant heating can last for many years, assuming that everything is properly installed and services. Your heating system is only as good as the services you provide for this system. If you have lackluster installation, maintenance, or repair services then your heating system won’t work at full power. If you find that your radiant heating system isn’t working the way it should, call for repairs promptly. We understand how urgent these matters are here in Pennsylvania, so we offer 24/7 emergency services for all your heating needs. We’ve provided excellent service for 40 years to Broomall and the surrounding area. We can provide you with the best services possible too. If you need great repair services for your radiant heater services here in Broomall, then contact Murphy’s Plumbing, Heating & Air Conditioning to schedule an appointment today.